Nightmares come in many forms. Some rend the veil of sleep with heart-stopping madness. Others defy sanity to leave a helpless corner of your mind twitching for release. Sometimes, hours after waking, a nightmare drifts across your memory, tainting your day with wisps of discomfort. 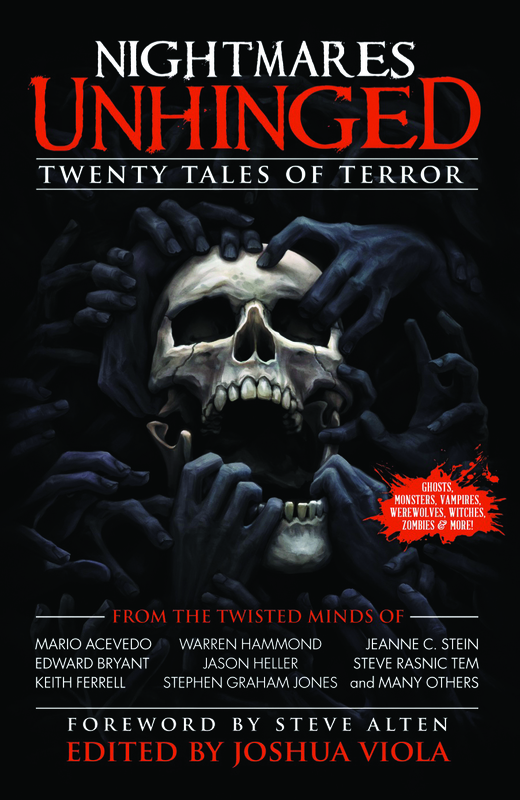 NIGHTMARES UNHINGED reveals horror in all its mutable forms—abject to absurd—through twenty tales of terror. Contributors include Mario Acevedo, Edward Bryant, Dustin Carpenter, Sean Eads, Keith Ferrell, Warren Hammond, Jason Heller, Gary Jonas, Stephen Graham Jones, J.V. Kyle, Aaron Michael Ritchey, Jeanne C. Stein, Steve Rasnic Tem, and Dean Wyant. Foreword by New York Times bestseller Steve Alten. Edited by Joshua Viola. Illustrations by Aaron Lovett. A portion of the book's proceeds will be donated to Rocky Mountain Cancer Assistance in honor of Melanie Tem.